Want a higher response from your sales letters -- up to 108% higher? Social scientist Randy Garner ran a study in which he sent out surveys to people, with a request to complete them. The little yellow square packed a big persuasive punch: More than 75% of people who got the survey with the sticky note request filled it out and returned it ... while only 48% of the second group and 36% of the third group did so. That difference is huge -- 108% higher response for a letter with a sticky note compared to a letter without one. More than double. Garner suggests that people recognize the extra effort and personal touch required to add a sticky note, and that they feel a need to reciprocate by agreeing to the request. As I’m sure you know from the classic book, Influence by Robert Cialdini, reciprocity is the social glue that helps bind people together in cooperative relationships. 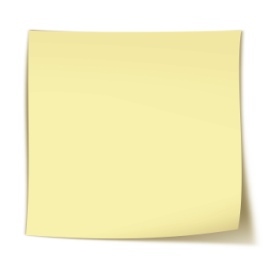 As this study shows, a simple sticky note can trigger reciprocity -- and increase response. Bottom line: Little sticky notes swing big doors ... and an ounce of personalized effort is worth a pound of persuasion. The above is adapted from the article, “How to Make Your Influence Stickier,” by Bob Adams, and is based on the book "Yes! 50 Scientifically Proven Ways to be Persuasive" by Robert Cialdini, Noah Goldstein, and Steve Martin. How can you use this idea in your marketing? What’s the next letter you plan to mail that could be improved by adding a sticky note? Please let me know -- leave a comment below. They send hundreds of thousands of mail pieces each week. And they're testing the sticky note to see if it boosts response. You might want to try it, too. I was struck by a story in Grow Rich With Peace of Mind, one of Napoleon Hill's excellent, but lesser-known books. It's about the curious incident of an insurance man who became rich after first giving away 90% of his working hours. One of my distinguished students, Edward Choate of the New England Life Insurance Company of Los Angeles, decided to help his government sell War Bonds during World War II. He devoted 80 per cent of his time to this effort for which he received no direct compensation. In addition, he gave 10 per cent of his time to counseling and training other life insurance men, his direct competitors. For this he neither asked nor received compensation. He used the remaining 10 percent of his time to sell life insurance on his own account. One might think that a man who gave away 90 per cent of his working hours would ruin his business. Let us see. A life insurance man is considered to do pretty well if he writes $1,000,000 worth of insurance in a year. During the first three months of one war year, Edward Choate wrote more than $1,500,000 worth. Most of this was written in his own office, on the lives of men who sought him out and asked him to accept their applications. They were men who remembered him in connection with the services he rendered while he was giving away 90% of his time. In giving of his time, Mr. Choate never hinted that he wanted anything in return. Yet such is the Law of Compensation that a return is inevitable. You may wish to look at it this way: every time you share your blessings with another, you become his creditor. Eventually, the debt is paid. Somehow, debts have to be paid. This story intrigued me, as it may you. But is it really possible to give away 90% of your time and still earn a living? I don't know, because I've never tried. But I have given away 10% of my time and/or money for years. And I can tell you it really works. Here's an example: A couple of cancelled projects left me with unexpected free time. So I decided to donate about 10% of my time next week to 3 good people in my network of friends and clients -- I'll be writing several letters and direct-mail pieces for them. A lukewarm prospect suddenly emailed to say, "The check is in the mail"
An ideal prospect who had "gone dark" for 2 weeks emailed to say, "Let's talk next week." You get the idea. There's a bunch of new business and revenue in my pipeline that wasn't there 24 hours before I "primed the pump" by giving away just 10% of my time for one work week. Now, make no mistake, I'm not counting any of these chickens until they're hatched. You can't put promises or introductions in the bank. And there is MUCH more to my marketing than giving away my services -- I mail 100-300 sales letters a week to generate leads, on top of all the referrals and add-on projects I generate from clients, the blogging, public speaking, article writing, etc. This is NOT another Pollyanna plea for you to "give something back." Please. If you're in business and you pay taxes, you already give back. What this is about is the simple idea that, by helping others, you help yourself. You can call it, "reap what you sow," or "get what you give" or even as Jesus said in Luke 6:38, "Give, and it will be given to you ... For by your standard of measure it will be measured to you in return." Whatever you call it, you've probably heard of it. But have you tried it? If business is slow, one of the fastest ways to boost your sales is to boost your ego. Because sales is just like dating -- desperation is NOT an aphrodisiac. And a sure way to feel better about yourself is to help somebody else feel better, by giving them of your time and skills. Try a literal tithing of your time this week -- donate just 10%. You'll put unseen forces into motion that enrich others as well as yourself. The more you give, the more comes back to you. I promise you'll be richer for it. You see, my client, Allstate Hall-of-Fame Agent and President of BGI Marketing Systems, Bill Gough, knows a thing or two about referrals. He's won every possible award at Allstate. He's brought in hundreds of millions of dollars in premium for over 2,133 different insurance agencies. He's spent 30 years and close to $910,000 on tracking results, testing, and learning. Over the years, Bill has found ways to take referrals from 4% to nearly 40% of his new business. That's a 900% increase. Not bad. And here's some hard-won advice I learned from Bill: A referral system starts with a referral culture. When somebody calls your business, always ask, "Who referred you?" When you ask assumptively this way, the caller thinks that referrals are normal and expected in your business ... and that you must be doing something right to be earning them. Extra benefit: Every time you or one of your employees asks, "Who referred you?" it strengthens your referral mindset ... which leads to more referrals. It's a virtuous circle that repeats over and over. Your referral culture, and the tremendous gains in new business you can expect, all begin with 3 words: "Who referred you?" "The Business Card That Increases Sales, Gets You Referrals On The Spot and Never Gets Thrown Away"
It’s changed everything for me. And it might change everything for you, too. 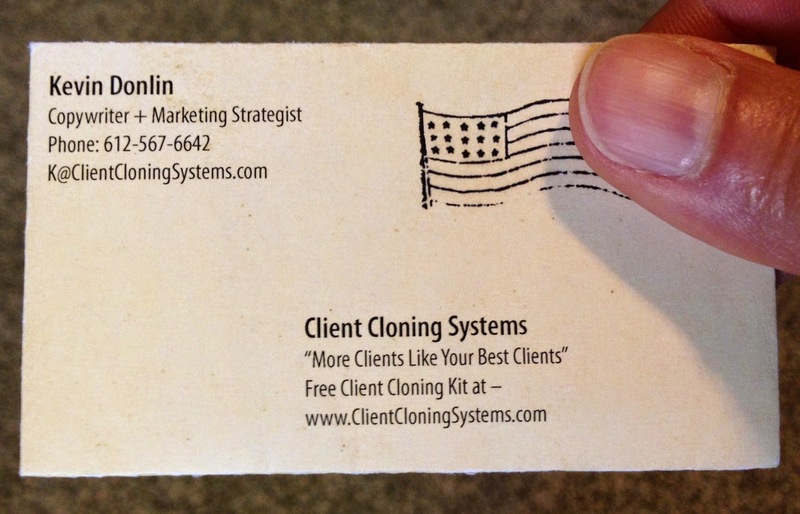 Honestly, you can’t even call this thing a business card, although it’s the same size as one. And it’s made of paper. But the similarities end there. I call it The Selling CardTM. 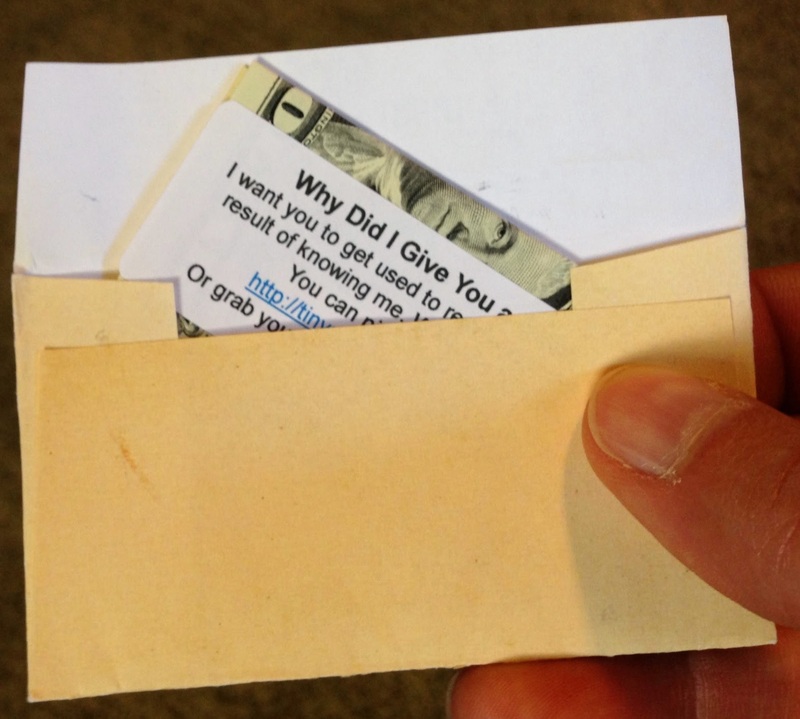 It may look like a business card, but it's actually a sales letter in disguise. And for every 10 of these “secret sales letters” that I hand out, between 2 and 5 people will immediately start a conversation with me that produces either a hot lead or a sale. That’s a response rate of 20% to 50%. By comparison, millions of dollars are made by sales letters with a response rate of 1-2%. Does your business card work that hard for you? I know the term secret weapon is overused, but please suspend your skepticism for a minute while I tell you how and why the Selling Card is indeed my Secret Sales Weapon -- and it might be for you, too. … I was at an exclusive $3,000-per-ticket seminar put on by Dan Kennedy, and a strange thing happened as I waited for the airport shuttle. I struck up a conversation with Mark, a wealthy business owner. The guy lives in a gated community in Florida where everybody has an airplane hangar instead of a garage. The people who live there are all pilots who own airplanes. As you can imagine, this is guy is no dummy when it comes to making money in business. So I was shocked after I handed him the kooky little Selling Card I’ve been using myself for 14 months. He absolutely loved it. And he started quizzing me like Sherlock Holmes, asking tons of questions: What is this thing? How does it work? What results are you getting? Even after we got to the airport, Mark was still buzzing about my Selling Card. We got past the TSA, we’re walking down to the gate, and he’s still quizzing me. Now to be honest, I’ve had lots of compliments before about my card. But something clicked this time. I started thinking that maybe Mark might not be the only one who would be interested and want to learn about this. The fact that you’ve read this far proves that you’re at least a little interested, too. Think about it: What’s a sales letter anyway? A sales message on paper. Why not take it a step further and put your sales message on a card? That’s what a Selling Card is. I mean, where’s the law that says your business card has to be name, rank, and serial number? Or that your card can’t deliver a “payload” inside, just like an envelope? We’re all “blind” to business cards. They are not new. They are not exciting. They do not and cannot sell by themselves. As a result, every time you hand out an ordinary business card, you’re missing a golden opportunity to turn a suspect into a prospect … and a prospect into a buyer. But a Selling Card is different. A Selling Card … sells. 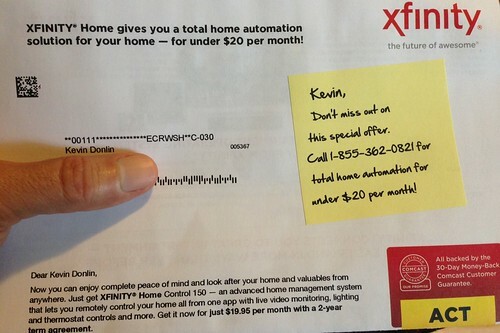 Because it delivers your best sales message for you -- just like a sales letter -- every time you hand it out. It puts you in a position of strength because your prospect is holding your card, actively involved in it, and impressed with you. A key secret: The Selling Card has a payload inside, with elements that prove you know what you’re talking, about no matter what you’re selling. And because your prospects’ hands are engaged with the contents of your Selling Card, they’re more likely to engage with you -- and buy from you. So ... why include all that stuff inside a sales letter? Because busy hands increase response. The more time you invest in a sales letter -- picking up the items that fall out, tearing little stamps and pasting them onto an order card, scratching off tickets -- the more likely you are to respond. 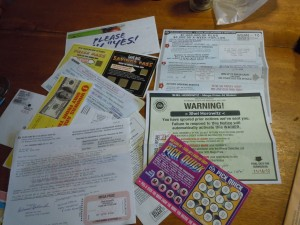 Because Publishers Clearing House is a direct-response marketing company that tests every element of every sales letter, they know exactly what they’re doing. And they’re doing more than $750 million in annual revenue mailing sales letters with involvement devices. Does your ordinary business card create busy hands? Of course not. It cannot. It’s just a flat piece of paper. That’s why I designed the Selling Card in the form of an envelope, which delivers a payload of involvement devices inside ... which creates busy hands ... which increases your response. 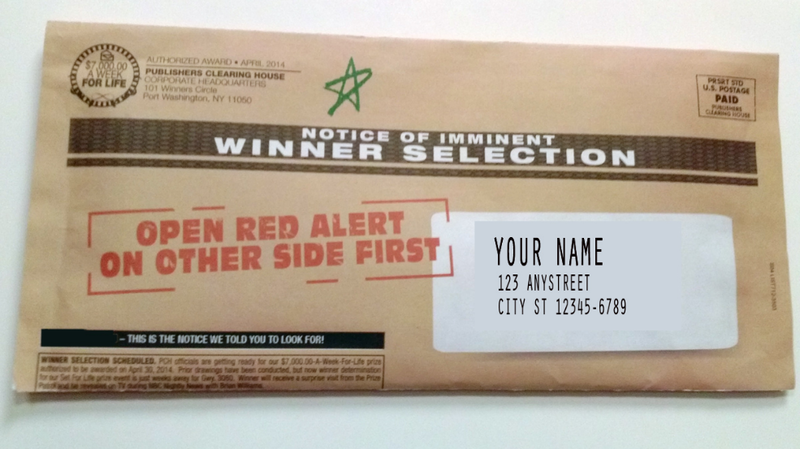 Remember, this is an actual envelope with something inside. Should the design resemble an envelope with a stamp or something else? Have you created a size that matches other business cards so it fits into your prospect’s wallet or pocket? These are all important considerations. Should your payload be money? If so, should it be U.S. money or foreign currency? Or something else entirely, like a tiny brochure, a list of five of seven tips, a coupon or a picture? What do you want readers to do when they open the Selling Card? Should they call you? Should they schedule a meeting online? If that’s too intimidating, should they email you? Should they do something else? What can you offer to boost response? These are all parts of an effective call to action that you need to consider. So, as you can see, there’s a lot going on behind the curtain when it comes to how you create and distribute your Selling Card. My response is this: The truly successful people in any industry are the ones breaking the rules of that industry. Whether it’s Apple with a smartphone that’s really a computer ... Uber with taxis that are really cars driven by ordinary people ... or you with a Selling Card that’s really a sales letter in disguise. If you’re ever wondering what to do in business, just do the opposite of what the majority are doing. Because the majority are always struggling. The majority are a herd. And nobody in a herd can ever get ahead because they’re all clumped together. Yes, it can be expensive to give away money in your Selling Card -- like the money you’re giving away every time your business card is ignored because it looks like every other business card. That can be expensive. When your business card says, in effect, “You can buy this stuff from anyone and I’m anyone,” that can be expensive, too. By the way, you don’t have to give away money with your Selling Card! There are unlimited options on what you can include in the payload inside. Question: If a Selling Card brings you just one more sale this month, what’s that worth to you? How about 12 more sales this year -- what’s that worth to you? An extra $1,200? $5,000? $12,000? More? Whatever that number, if a handful of extra sales this year are worth more than $1,200 to you, The Selling Card is something you absolutely need in your toolkit. ... you can get your own Selling Card in about 14 days, along with $1,295.00 in Free Bonuses. It’s a simple process that gives you a Selling Card -- one that's 100% unique to YOU -- in about 14 days. That’s it! You can be starting more conversations and closing more sales in about 14 days. You must fully understand how the Selling Card works and what words to say before handing it out to prospects. Otherwise, like trying to perform surgery without training, you’ll end up committing malpractice instead. When you take action and enroll today, you’ll get personal training from me in the scripting and delivery secrets you need to make the Selling Card work for you. The Paper Email Blueprint is NOT about mailing thank you notes or postcards. You do NOT send out cards, there are NO pictures or lumpy items inside. It’s just a powerful little tool that works like crazy to bring you more business. And it’s yours FREE, when you enroll today. When you add it all up, these 2 FREE Bonuses are a value of at least $1,245.00. When you consider that my typical copywriting project starts at $3,995 and tops out at $30,000, you’re getting my writing help for pennies on the dollar. Plus you get $1,295 in 3 Free Bonuses on top of that. And all you need is just ONE new client and your new Selling Card, available for a limited time at only $795 $395, pays for itself. Your Risk-Free Guarantee – You must get more clients more easily and love your Selling Card. If you don’t love it, for any reason or no reason during the 365 days after purchase, just let me know. You’ll get a prompt, full refund and you keep all your Selling Cards and all your free bonuses as my gift. No questions asked and no hassles. Good for one full year. So, don’t decide today. Just give this a shot and try your own Selling Card for a full year. I mean, how much are 12 new clients or customers worth to you? $1,200? $12,000? $36,000? That’s the bare-bones minimum payback you can expect from your Selling Card, when you start giving it to prospects and becoming the center of attention at industry events and meetings. It’s a card you’re proud to hand out ... it lets you leapfrog to the top of the ladder thanks to all the attention you get ... and it’s a money-making asset that’s yours forever. You can’t lose, thanks to my very public money-back guarantee, which is how I’ve done business since 1994 -- twenty years! 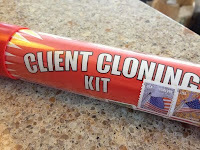 I have NO unhappy clients and I’m not about to start with you. ... and when demand increases, so will the price. It will NEVER go down, only up. Why not take advantage of this introductory offer now, while there's time? P.S. If you want to stop selling the hard way -- and turn your ordinary business card into a goose that lays golden eggs -- you owe it to yourself and your family to try The Selling Card. If you’re struggling to stand out from the crowd in any industry -- insurance, real estate, financial services, industrial sales, health and fitness, professional services -- The Selling Card replaces your ordinary business card and solves that problem for you, instantly. You can't make a mistake, thanks to my outrageous money-back guarantee. If you don’t love your results, you get your money back -- and keep your FREE gifts worth $1,245.00. ... because I’m not a writing factory. I’m just a one-man army. It takes time away from my $5,000 and $7,000 projects to create Selling Cards for only $395 ... and as demand increases, so will the price. You risk nothing. Take action now, before someone nudges you out. ... one of the most powerful ways to share a positive message is to recruit other people to spread it. A colleague, Adam Grant, Ph.D., of the Wharton School of Business, looked at the effect of having a company’s leader give a motivational speech to a team of new hires at one of his call centers. With his message alone, the positive leader created a moderately good bounce in revenue for the call center -- 300 percent over the results of a control group who didn’t hear the speech. But if the team heard both the leader and a grateful “beneficiary” (in this case, an employee who had been at the call center for a while and was positively affected by the work being done there), something incredible happened. For this group, revenue increased by 700 percent compared to trainees who heard no motivational messages. That’s not a misprint -- 700 percent. 1. If you lead a team, enlist other people to help you. 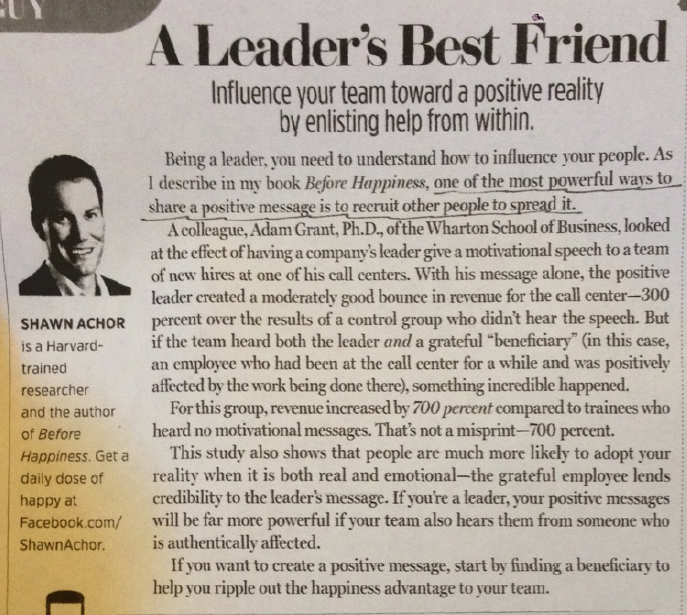 As the article shows, an emotional testimonial from someone else can be more than twice as effective (700% vs. 300%) as you trying to inspire your people by yourself. 2. More broadly, if you sell to others (and we ALL do), enlist your clients and customers to help spread your message. The easiest and most-effective way to do this is with testimonials. As the article (and my 20 years of experience) shows, what others say about you is more than twice as effective (700% vs. 300%) as what you say about you. Bottom line: One of the most powerful ways to sell yourself -- whether internally to your team or externally to your clients -- is to let others sell you, with their own stories, in their own words. Treat testimonials just like Krugerrands. They're small, incredibly valuable things. And you can never have too many. Start collecting them today -- and using them in your business.